LASIK has become has become one of the most popular elective procedures in the United States today. Approximately 500,000 to 1 million LASIK procedures are performed annually. LASIK is an acroynm that stands for "laser assisted situ keratomileusis." During a LASIK procedure, surgeons use a microkeratome blade to create a thin flap of tissue to expose the stroma (the middle layer of the cornea), which is the clear dome-like structure in the front part of your eye. An excimer laser is then applied to the exposed stroma to gently remove tissue in an attempt to reshape the cornea and correct such vision problems as nearsightedness, farsightedness, and astigmatism. The thin flap of tissue is then put back into place. Lifestyle Assessment: An important evaluation for all eye surgery is for the surgeon to discuss your lifestyle, personality, and occupation. It is important to talk to patients about how they use their eyes before having LASIK and what type of demand they have on their vision. 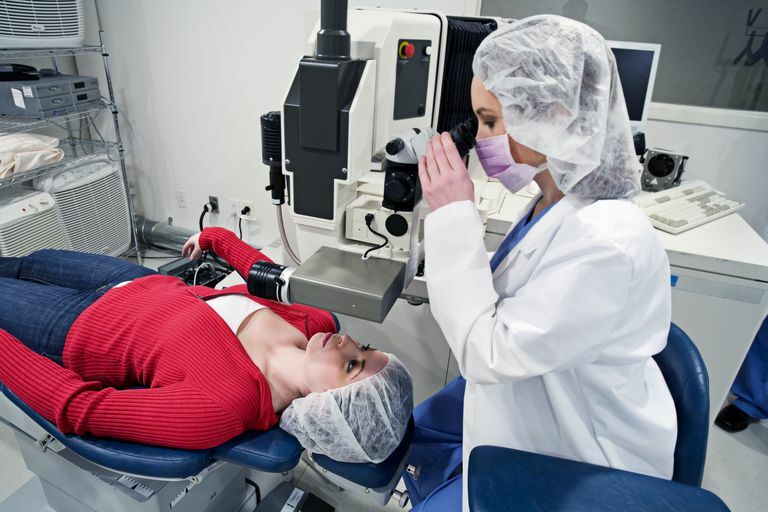 Expectations should be set for the likely results that will be obtained with LASIK. While most people that have LASIK are pleased with the results, there are some that have a result that was a little different that what they expected. Most people expect 100% eyeglass free vision after LASIK and that is not always the result. Corneal Topography: Corneal topography is a computerized method of determining the exact topographical shape and power of the cornea. Measurements are computed and placed into color maps. Hotter colors, such as red and orange, show steeper areas, while cooler colors show areas of the cornea that are flatter. Wavefront Analysis: Wavefront analysis is a relatively new development in eye care and can be very important in measuring higher-order aberrations of the human optical system. Higher-order aberrations are types of vision deficits similar to lower-order aberrations, such as nearsightedness, farsightedness, and astigmatism, but represent different distortions. They seem to be more apparent in some people and often cause such symptoms as decreased night vision, glare, and halos around lights. Corneal Thickness Measurements: Pachymetry is known as the measurement of the thickness of the cornea. This is important for LASIK patients because the procedure changes the power of the eye by reshaping and removing corneal tissue. Accurate Pupil Size Measurements: Nighttime and daytime pupil size is important for quality of vision after LASIK. People with naturally large pupils or pupils that dilate heavily in dim light may have more glare, halos, and contrast problems after having LASIK. As your scheduled LASIK surgery approaches, keep in mind that a few rules have been established for you to follow as safeguards. Following these suggestions will help encourage a positive outcome. Medications: Be sure to fill any pre- or post-operative medications that your refractive surgeon prescribes before the procedure. You don’t want to be running around town or sitting around a pharmacy waiting for your eye medications after your surgery. Transportation: Be sure to arrange for transportation after your surgery. You will need to have a friend or relative drive you home. Although improvement in vision is almost immediately noticeable after LASIK, some people are very blurry, and driving may be dangerous. You may also be a bit groggy from anti-anxiety medications that may have been given to you. Also, just going through the procedure, although quick, creates a bit of stress, and this may make you a bit disoriented. Azar, Dimitri T. and Douglas D. Koch. LASIK - Fundamentals, Surgical Techniques and Complications, 2003.